A configure script is an executable script designed to aid in developing a program to be run on a wide number of different computers. It matches the libraries on the user's computer, with those required by the program before compiling it from its source code. As a common practice, all configure scripts are named "configure". Usually, configure scripts are written for the Bourne shell, but they may be written for execution in any desired shell. One must type ./configure rather than simply configure to indicate to the shell that the script is in the current directory. By default, for security reasons, Unix operating systems do not search the current directory for executables so one must give the full path explicitly to avoid an error. The first line includes the mpfr and gmp libraries. The second line tells make to install the final version in /home/myname/apps. The INSTALL file contains instructions should the prescribed steps fail. Software developers simplify the challenge of cross-platform software development by using GNU's Autotools. These scripts query the system on which they run for environment settings, platform architecture, and the existence and location of required build and runtime dependencies. They store the gathered information in configure.ac or the now deprecated configure.in to be read by configure during the installation phase. In new development, library dependency checking has been done in great part using pkg-config via the m4 macro, PKG_CHECK_MODULES. Before pkg-config gained popularity, separate m4 macros were created to locate files known to be included in the distribution of libraries depended upon. The first program to come with a configure script was rn by Larry Wall in 1984. The script was written by hand and produced a jocular running commentary when executed. It still survives as part of the build system of the trn program. 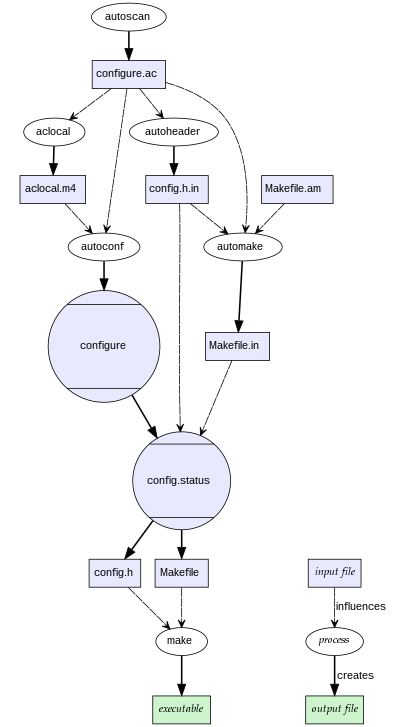 Since then, an ecosystem of programs has grown up to automate the creation of configure scripts as far as possible, of which the most common is the GNU Autoconf system. ^ "Compiling Linux Software from Source Code". Control-Escape's Linux Help Engine. Retrieved 20 November 2010. ^ "Autoconf - GNU Project - Free Software Foundation (FSF)". GNU Operating System. Retrieved 20 November 2010. This page was last edited on 13 May 2018, at 22:50 (UTC).